Edition: Numbered 46 of 50; published by Leiris in 1961 without steelfacing before the cancellation of the plate. Fifteen artist’s proofs were published at the same time. The suit was settled in 2016, four months after the show had ended, in Gagosian’s favor, who in turn sold it to the famous Picasso collector, Leon Black. Gagosian had agreed to purchase it for around a $106M, but Maya had allegedly already agreed to sell it to Qatar for &42M. Reportedly it was one of Maya’s faves, and I do not know why she parted with it. This very plaster, as well as a number of other sculptural greats in the series, were on view the year before at that MOMA show. (There was an excellent accompanying exhibition catalogue.) The flurry of recent sales of the etching at hand, as well as the related B250 etching are my most direct ways to gauge the general interest in this sculptural series. By contrast, in all the 14 years since the inception of our dealership, we sold but one of these etchings, yet another impression of the etching at hand. It is likely that the MOMA exhibit, as well as the re-opening of the Picasso Museum in Paris, which has a number of these sculptures on permanent view, have piqued the interest in this amazing sculptural series. Picasso created other equally great sculptures before and after, such as the baboon bronze made of two toy cars, or the she-goat tethered in the courtyard at the MOMA (another cast is on view at the Picasso Museum Paris)—you can fill in the blanks with your other favorites, but they were generally one-offs. The Marie-Thérèse sculptures, however, comprised Picasso’s greatest sculpture series. After a two-decade hiatus from sculptural modeling, Picasso began this series in 1928 but quickly realized he needed more space. He also desired some privacy for himself and his new mistress Marie-Thérèse, away from his estranged wife Olga. So two years later he purchased a chateau for this dual purpose. It was located in Boisgeloup, a town not far from Paris. There was a stable on the property, which he converted into a sculpture studio, where he channeled a great burst of creativity into plaster over the next two years and gave birth to a large number of fantastical humanoid sculptures loosely based on his muse. By 1933, Picasso’s paintings, drawings and prints of the period had become a self-reflective celebration of these sculptures, and the sculptor’s studio became their principal subject. The Vollard Suite featured many takes on the sculptor’s studio, often combining neoclassical representations of the sculptor and his model alongside graphic representations of this surrealist sculpture series. 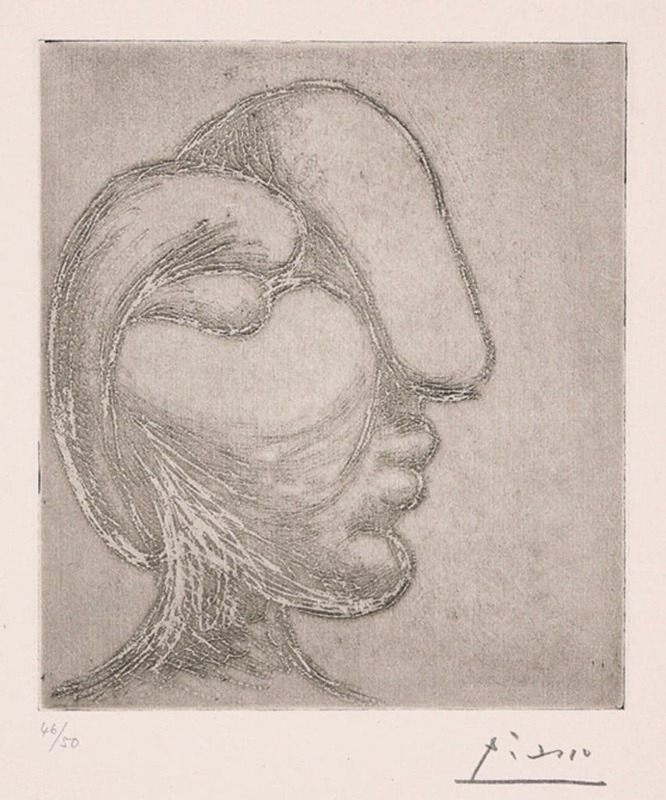 But he also created several closeup etchings and drypoints of the sculptures themselves. The tour de force at hand is Picasso’s most accomplished rendering of a sculpture in a two-dimensional medium. If my experience of this artwork is at all like that of the typical viewer, when looking at it, I first grok that the subject is a woman in profile. At the same time, I can’t help but notice that her features are grossly distorted. I eventually make my way to her lips, which are rendered more tenderly and more realistically than the remainder of the composition and, with the nearby cheek and chin and even the bottom of the nose, create an emotional focal point that humanizes and feminizes the entire composition. Without these semi-realistic features, this would have been an abstract composition only arguably representing a human head. 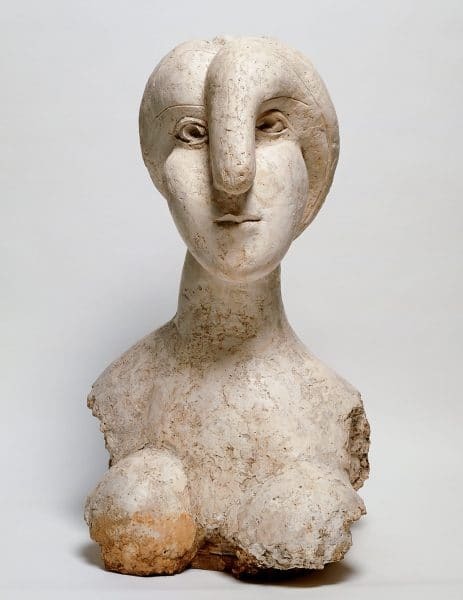 It took Picasso’s genius to make this inventively bizarre head seem nonetheless feminine and human. It amuses me to wonder whether you the viewer experienced this artwork similarly, or whether its creator did. Picasso claimed (in so many words) that much of his process was subconscious, so I’m not implying that this was necessarily his conscious intention. But by this point in the artist’s life, he had been sensualizing his female portraiture for decades. As is readily apparent from the rather long list of references above, this magnificent artwork has been included in every general survey of Picasso prints, at least those in our library. It is significant on several levels. In 1931 and -32, Picasso developed a sensational, unique style, one more in a chain of innumerable unique styles, in which Marie-Thérèse’s facial features were modeled in plaster with exaggerated, thick, rounded forms, which have been likened to ropes or sausages by various writers. The results in plaster and later in bronze were magnificent and compelling. 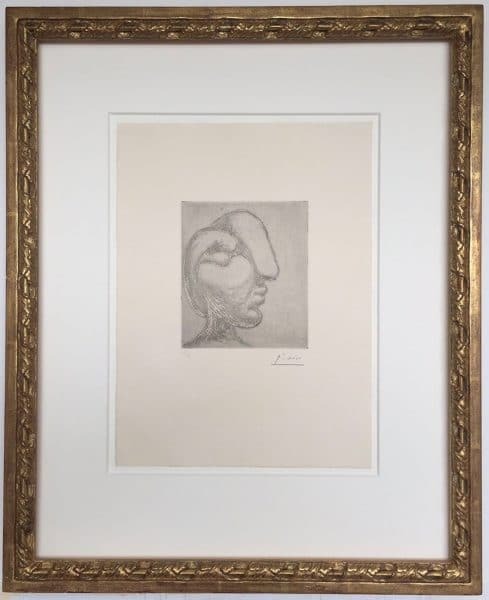 About twelve months later, in February and March, 1933, Picasso made several etchings of Marie-Thérèse’s head, including this one, that look very sculptural and are in fact modeled in the same style as the recent plasters. Two of these, Bloch numbers 250 and this one, 256, are simply amazing works. That Picasso could create such shapes out of plaster was amazing enough, but that he could imbue their two-dimensional representations on paper with such sculptural volume was in and of itself incredible. Tête de Femme is also unusual because it is perhaps the only Picasso print, in addition to his lithographic fingerpainting (Paloma et Claude, Bloch 664, see elsewhere in this catalogue) in which not only is the artist’s creation absolutely charming, but also his technique itself is charming. In creating this portrait, Picasso used his mistress’ nail polish as a sort of resist with which he drew directly onto the raw copper plate. Then, a prolonged dip in acid lowered the surface level of the copper plate everywhere except where the nail polish had been applied, yielding a “negative engraving” in which the image, rather than engraved into the plate itself, is presented in relief, such that everything other than the image would get the printer’s ink. Baer refers to the medium of this print as an etching, but that is likely because the actual technique, unique in this application yet somewhat akin to aquatint, has yet to be named. The result of this unique printmaking process is that this is one of the most beautiful–and beautifully printed–Picassos of all. 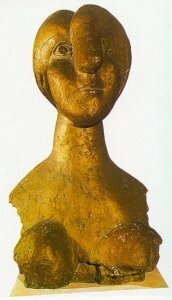 This 2-D “sculpture” seems poised to attain the same popularity as the earlier, more realistic portrait of of Marie-Thérèse, the 1928 lithograph entitled Visage (B95). Picasso created Visage within a year or so of their first meeting, when he was more inclined to portray his lover realistically. But, true to form, Picasso wouldn’t play it straight for long—just five years later and the subject is barely recognizable. We can ID her only by the hints at her short hair and aquiline nose. Like Visage, an artwork of similar size, this later portrait is printed dark and bold, so that Marie-Thérèse is well seen from across the large room, which she nonetheless commands at a distance of 20 feet. Yet at an edition size one-fifth of Visage, this Tête de Femme, especially in desirable condition, is much harder to find. And, however charming Visage is, we don’t really need Picasso for his realistic portraiture. We most certainly do need him for his inventiveness!